Just the thought of having financial freedom sounds refreshing, doesn’t it? In order to obtain this freedom many turn to a career in sales or owning a business. If you are in either of these categories or are considering these options, this program is a must for you! I started my first business at eleven years of age and my second business at age fifteen. Being in sales and in business, especially at such an early age, has its own set of challenges. You must learn how to determine the amount of risk that is appropriate, how to market your product and service, and how to evaluate your progress. I start off by sharing with you a bit about how I started my first business. I also share with you one of the biggest motivating factors that got me started in business. Too often many people work for years trying to become successful but are eventually forced in to bankruptcy. I am going to share with you this mistake. Are you creating some of these negative patterns right now? If you are it could ruin your financial future. I offer more details in this session on increasing your sales and growing your business. No matter how small or large your business is you’ve got to understand how to analyze your sales. I’ll show you how this is done, how it works and what a huge difference it makes in your success. Unfortunately, due to poor business ethics by businesses and sales people, consumers have become less trusting. I will go over why we lose business and why customers don’t come back. You can’t afford this to happen. There are two mistakes that most small businesses or salespeople will do when it comes to customer compliments, often fed by pride and ego. The solution is very counter intuitive, but if you don’t get it right the first time you can run things into the ground overnight. If you don’t master this concept it will cost you big money and your reputation. It’s interview time! In this session I will introduce to you the millionaire mentor that I had when I was 16 years old. One thing you get immediately from listening to Manu Mahtani is that he knows his stuff when it comes to investing money wisely and how to make money work for you no matter how little or how much of it you have. A number of years ago I had the opportunity to meet Ron Rice at a celebrity invitational. As you might know, Ron was the founder of the famed Hawaiian Tropic. You’ll here his most unique story from how he started to build his empire in his garage with an aluminum trash can to where his business is now with revenues of 200 million dollars a year. As you already know, one of my goals is to build as much value as possible in my programs. Just listening to Ron’s story and how he got to where he is now is very inspirational. Okay, get ready to meet one of my most unique Millionaire Mentors. His name is Bernie Little Sr. I’ve known Bernie since I was about sixteen years old. One of the many things he did was buy and sell jets. One of my loves! I used to hang around the airport as Bernie bid on some incredible jets. Recall on the CD after Ron Rice that I told you I would read between the lines and give you additional insight on how you can apply the wealth of knowledge that he shared. This session is going to be no different when it comes to Bernie Little. You will be in for a treat here! I interview Motivational Speaker Les Brown. Les has been a great friend for years. What an interview it was! If you’ve ever heard Les speak, you’ll know he’s not short on words and he made no exception for this interview. Born a twin in low-income Liberty City in Miami, Florida, Les and his twin brother, Wes, were adopted by Mrs. Mamie Brown. I am going to do the same thing for you on this CD as we did for Bernie Little. I’ll read between the lines of wisdom and advice Les shared and give you additional insight on how you can apply the wealth of knowledge that he offered. Manu Mahtani is back again! From all the feedback I get from the thousands of people who have invested in this program, they all express the practicality that Manu offers. I am sure you will agree after listening to our previous interviews. It only made sense to bring him back to share more. No one needs to tell you how challenging it is to be in sales or to manage a business. But there is hope. Manu offers many ways to place your operation on autopilot; what he calls ‘the cloning project’. You won’t be able to get enough of this guy! He’s got more for you especially if you have to manage other people or teams. If you have employees, you know how challenging it can be keeping them focused on projects in order to meet deadlines. Manu will offer some killer tips in this area. Manu’s real financial genius comes out in this session. He knows how to invest small amounts of money in order to achieve great dividends. It’s true, I’ve seen his financials. He discusses why big investments can start with small steps and why he doesn’t put all his eggs in one basket. Manu will discuss these small steps in detail. Manu keeps on giving more and more of his killer money making strategies. He explains that there is one major niche that all people or businesses have but more usually do not take advantage of. It’s a niche that will make you money especially when others don’t tap into it. This is Manu’s final CD. I can assure you, by now you will be bouncing of the walls to move forward and get things going more than you ever have. I get excited just sharing this stuff with you. Now you know why I can’t sleep at night! Here is a great opportunity to listen in to an interview with a Billionaire. He is the wealthiest man in the Caribbean and the owner and founder of Sandals & Beaches Resorts and his name is Gordon ‘Butch’ Stewart. His friends call him Butch. This is our final CD where I review the entire series. This is something you should get into the habit of listening to at least once a month or so. There is so much value in this program that you will want to keep reviewing it so that you stay focused and continue implementing new ideas. 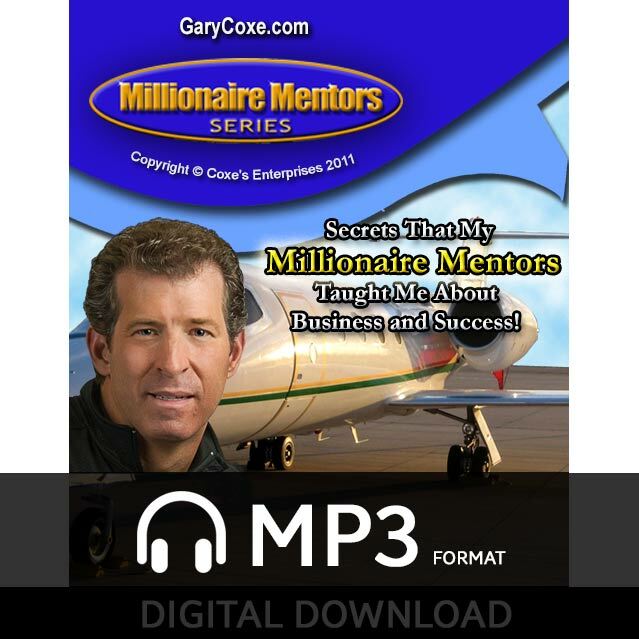 After you complete this series in its entirety you’ll be glad that I was able to share with you Secrets That My Millionaire Mentors Taught Me About Business And Success!